After a successful first year together, it made all the sense in the world for the Sixers to run it back with guard JJ Redick. And after LeBron James decided to take his talents elsewhere in free agency, the Sixers did just that, agreeing to terms with the veteran sharpshooter on another one-year deal. ESPN's Adrian Wojnarowski was the first to report the details, which PhillyVoice can confirm after discussing with team sources. The exact number here will be of some importance, but using those numbers as a general guideline, the Sixers now have around $13-14 million left in cap space with which to fill out the rest of their roster. That's enough money where they can be fairly creative, either paying over market for one of the names left on the table, or splitting the money between a couple dependable veterans to help bolster the rotation. Before we get to that part of the equation, however, Redick's own contributions should not be glossed over. He was a critical part of helping Joel Embiid and Ben Simmons succeed last season, and had the highest scoring season of his career playing next to the young stars. It would have been near impossible to replace his shooting diversity with just a single player, and now Philadelphia doesn't have to. 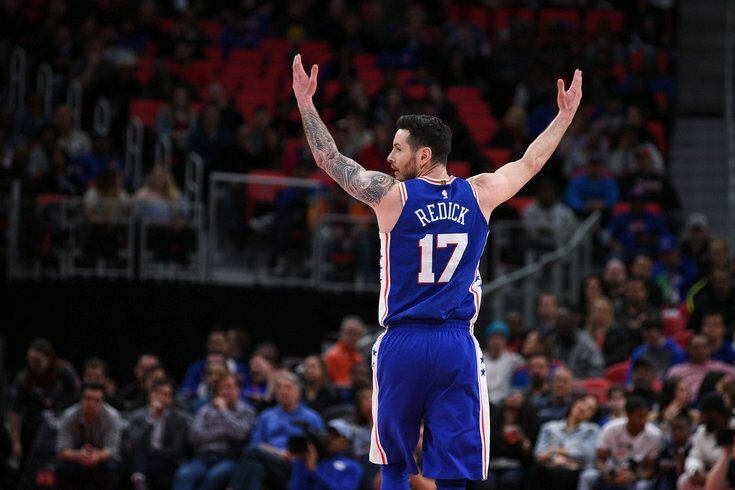 Redick also established himself as a great presence in the locker room last season, leading with both his voice and his actions on and off the court. As Markelle Fultz went through a very public struggle with his jumper last season, it was Redick who stepped up in defense of his young teammate, in addition to taking time to work through shooting tips and tricks with Fultz at the end of Sixers practices. There are a lot of empty platitudes that get thrown around about "veteran leadership," but Redick exemplified that for Philadelphia in his first season here. Before you know it, the makings of a rotation are basically already in place now. Last year's starting five of Embiid, Dario Saric, Robert Covington, Redick, and Simmons will all return barring trades, Markelle Fultz will feature heavily, Zhaire Smith will get developmental priority, T.J. McConnell will continue to do his thing and plug in the gaps, and that already puts you at an eight-man rotation. Sprinkle in another wing player and a backup big man, and suddenly the 2018-19 Sixers have taken shape without much fanfare. There are a number of potential candidates on the market that are either stylistic fits or with reported connections to the Sixers, but what this deal might really say the most about is Philadelphia's future plans. Locking in Redick on another one-year deal allows them to preserve cap space for the summer of 2019, which is their last big crack at free agency with extensions looming for some of their biggest contributors. Without saying so, the Sixers have effectively signaled they are still big-game hunting. How you feel about that probably depends on your patience for Philadelphia to upgrade the rotation; in a vacuum, this doesn't help the Sixers get to any higher of a level than they already hit last season. If you wanted them to make dramatic changes or go all-in to compete this season, you might come away disappointed. But there is something to be said for stability now that Philadelphia's core pieces are in place, and his brand of excellent three-point shooting is a gift that keeps on giving. The Sixers probably weren't going to get better value for their money on the open market, and can now preserve the five-man unit that propelled them to such great heights throughout last season. Not the flashiest move in the world, but one I think is ultimately the right call for the Sixers.